With word art or illustrations on every second page, and no huge blocks of text or intimidating words, they're perfect for newly independent readers. Hey Jack! is a companion early reader series featuring Billie B. Brown’s best friend, Jack. Billie doesn't think in terms of what boys or girls should do she is just who she is. 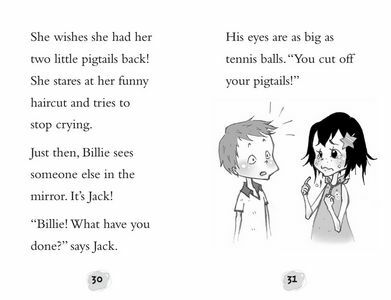 She and Jack (of Hey Jack) both navigate situations that young children are involved in. These books do a very good job of talking about how emotions are shown in other people as well as what they feel inside and making decisions based on those emotions. Lots of lessons to be had but in a very engaging and age-appropriate way. These books make my 6 year olds feel like super heroes! They can read the text fairly easily and thoroughly enjoy the stories. I'm a huge fan of the wonderful life lessons learned in each book as well. Sally Rippin was born in Darwin, Australia, and grew up in South-East Asia. As an adolescent she studied traditional Chinese painting for three years in Shanghai and Hangzhou. Now Sally lives in Melbourne where she writes and illustrates for children of all ages. She has had over 50 books published.